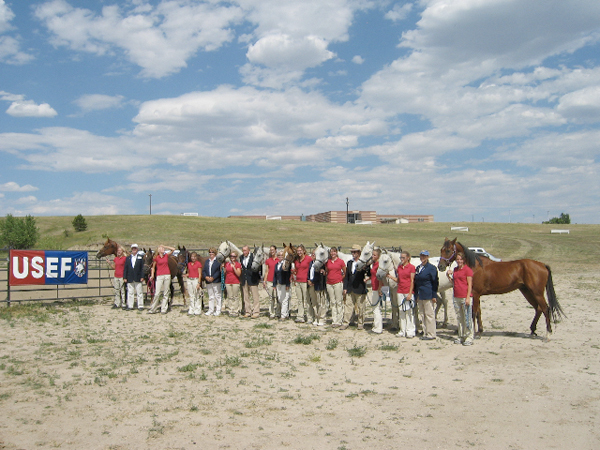 The first North American Endurance Championship for Young Riders was held at the Colorado Horse Park in Parker, Colorado. 10 young riders started the event at 5:45, and Jessica DiCamillo and Crestwood Premier crossed the finish line at 4:23:30 PM for a first place finish and a total ride time of 7:48:30 in the 75 mile event. A tight race to the finish placed Caitlin Massman and CHF Adios in 2nd place with a ride time of 7:48:32. Young riders are gathering this week in Parker, Colorado, for the FEI North American Junior and Young Rider Championships. Several FEI equestrian disciplines will be represented in the Championship: Dressage, Eventing, Jumping and Reining. There will also be a Junior & Young Rider CEI*** Endurance competition, but due to the strict FEI qualification requirements for a North American Championship competition, USEF opted to hold an open competition rather than an official Championship for Junior and Young Rider (14-21 yrs) divisions so that more young riders could participate. While the Endurance event is not officially part of the NA Championship, riders from the various disciplines will reap the benefit of sharing the venue and the experience of a high level competition. BAHRAIN'S Royal Endurance team put in a strong showing in the Thetford Endurance Race in England, with five of its top riders finishing among the top 10 in both the event's race categories. In the 120-kilometre race, Bahrain Royal Equestrian and Endurance Federation (Breef) first vice-president Shaikh Khalid bin Hamad Al Khalifa, riding his horse 'Sprite', finished sixth overall, while Royal team leader and Breef president Shaikh Nasser bin Hamad Al Khalifa, on his horse 'Sebastian', finished ninth overall. In the same distance, Shaikh Daij bin Salman Al Khalifa, on his horse 'Wishky', came in 10th place. UAE rider Hussain Ali Al Marzooqi won the race, while second place was claimed by teammate Majed Ahmed Al Sabri. Shaikh Khalid completed his event in a time of 5:47:45 for sixth, while going for an average speed of 20.07kph. Shaikh Nasser, on the other hand, completed the 120km distance in 6:15:22, with a similar average speed. Meanwhile, in the 160km race, Bahrainis Mohammed Abdulaziz riding 'Kahir' came in an impressive fourth and teammate Yousef Taher riding 'Canada Coy' finished fifth. The win was clinched by UAE rider Abdulla bin Hazim, while second place went to his teammate Shaikh Majid bin Mohammed bin Rashid Al Maktoum. Bahrain Royal team consisted of another two riders Mohammed Al Thawadi on 'Ciscada' and Lorent Mosti from the technical team riding 'Bisk'. The race featured participants from Bahrain, UAE, Qatar, the UK, France, India and Saudi Arabia. Among them was UAE team leader UAE Vice-President and Dubai Ruler Shaikh Mohammed bin Rashid Al Maktoum, and Dubai Crown Prince Shaikh Hamdan bin Mohammed bin Rashid Al Maktoum. Shaikh Khalid and Shaikh Nasser met with Shaikh Mohammed after their respective events. The event will be the Bahrain team's third participation for the season. The first was the Bahrain Cup in England, while the second race was in Austria. The Royal team competed as part of their preparations for the International Federation of Equestrian Sports World Endurance Championship, which is scheduled to take place in Terengganu, Malaysia in November later this year. south-west of the town of Sundre, AB July 31 - August 4, 2008.
champions being named in each sport. just the Championship events, but in many of our other featured events." would like to be a part of it." them on, volunteer or offer financial support!! two years. The first Nationals were held in Ontario in 1984. Kananaskis Country 1988, RAM River Falls 1996. Rocky Mountain Challenge will benefit CASE (Central Alberta Special Equestrian), a therapeutic riding program. LONDON, JULY 29 (BNA) LEADER OF THE ROYAL TEAM SHAIKH NASSER BIN HAMAD AL KHALIFA AND LEADER OF KHALIDIYA STABLE SHAIKH KHALID BIN HAMAD AL KHALIFA HAVE APPRECIATED THE GREAT ROLE PLAYED BY UAE VICE PRESIDENT, PRIME MINISTER AND DUBAI RULER SHAIKH MOHAMMED BIN RASHID AL MAKTOUM IN SUPPORTING ARAB EQUESTRIANS DURING THE EUROPEAN RACES HE AND HIS SONS WERE TAKING PART IN. DURING THETFORD RACES, SHAIKH NASSER AND SHAIKH KHALID MET WITH SHAIKH MOHAMMED BIN RASHID AL MAKTOUM AND HIS SON SHAIKH HAMDAN AND SENSED THE TREMENDOUS SUPPORT OFFERED BY DUBAI RULER TO ALL ARAB EQUESTRIANS TO BEST REPRESENT THE ARAB NATION AND PROJECT ITS GENUINE GOOD IMAGE. SHAIKH NASSER LAUDED THE BROAD EXPERIENCE DUBAI RULER HAS IN WHATEVER PERTAINS TO HORSE RIDING AND EQUESTRIAN RACES NOTABLY ENDURANCE COMPETITIONS. ON THE OTHER HAND, SHAIKH NASSER SAID THE TEAM WAS WELL PREPARED FOR THE NEXT RACES INCLUDING THAT OF THEFORD ON AUGUST 10, TO DRAW BENEFITS FROM THE VARIOUS TOUGH COMPETITIONS, ATTAIN GOOD RESULTS AND BE FULLY READY FOR THE QUALIFYING ENDURANCE RACE IN MALAYSIA AND THE WORLD ENDURANCE CHAMPIONSHIP. SETIU, July 27 (Bernama) -- Nazulki Muda from Darul Iman Endurance Terengganu Club (DIET) emerged champion in the third circuit of the Malaysian Endurance Championship at the Terengganu International Endurance Park (TIEP) in Lembah Bidong here Sunday. Riding Indiana Rose in the 160km race, Nazulki who clocked 12 hours 43 minutes and 52 seconds led the field ahead of Mohd Azizi Ismail from Tengku Mahkota Kelantan Club who registered 12:56:20s. Another Tengku Mahkota Kelantan Club rider, Zainuddin Mohd Yusof came in third when he registered 13:08:23s. Nazulki walked away with RM5,000 while Azizi collected RM3,000 and Zainuddin RM2,000. Seven other riders failed to complete the race. In the 80km race, Yusnar Yusup from Bukit Kiara Club crossed the finishing line in 6:25:30s to outpace 12 other riders to emerge winner. Muhamad Arif Samsuri from Kuala Lumpur City Hall finished a close second when he clocked 6:39:16s followed by Azman Mat Ripin from DIET who registered 7:16:24s in the third place. National Sports Institute director-general Datuk Dr Ramlan Abdul Aziz gave away the prizes. He said so far 12 national riders qualified for the World Endurance Championship at TIEP in Lembah Bidong in November. Guatemala goes to the World Endurance Championship. Guatemala. The Mayan Adventure Ride 2008 - The Ingenio Magdalena Challenge 1st Edition, ended successfully on Sunday the 20th of July. The Mayan Ride 2008 proved that Guatemala can stage an event that is up to the highest international standards, classifying international riders for their participation in world wide events of Endurance. This event places Guatemala at the vanguard of the whole region with the capacity to develop this equestrian discipline with the participation of excellent riders, FEI approved judges, veterinarians and officials. Several months ago, Jinetes de Aventura Endurance - Endurance Adventure Riders, decided to organize a qualifying event for the Malaysia Endurance World Championship 2008. The decision to hold the event was based on several factors. The Guatemalan Endurance Riders had performed very well at many international events and they had a good chance to qualify. Guatemala has geographical regions and climatological conditions that are very similar to Malaysia. If the riders could successfully finish the race in theses conditions they would have a good chance to perform in Malaysia. ALTHOUGH, Mohd Azizie Ismail only finished second in the Malaysia Endurance Circuit Series Three yesterday, he was the biggest winner as he earned his second Certificate of Capability (COC) which qualifies him for the World Endurance Championships on Nov 6-9. Mohd Azizie, who represented the Tengku Mahkota of Kelantan Equestrian Club (TMKEC), completed the 160km-race at the Terengganu International Endurance Park (TIEP) in 12:43:20s astride Janor Fee. The 24-year-old had earned his first COC in the event's Series Two in May at the same venue. "It's great to qualify for the world meet. The race was tough as it was raining heavily today (yesterday). I'm lucky to be one of the only three competitors to finish the race," said Azizie, who pocketed RM3,000. Azizie is the 12th Malaysian to qualify for the world meet. The quota offered to Malaysia is 12. However, in the event that more than 12 locals qualify by the Aug 21 qualification deadline, a special trial will be held by the National Sports Institute before submitting the final list on Oct 1 to the Federation Equestrian International (FEI). Currently, there are about 10 riders with a single COC competing in several tournaments in Argentina and Australia, gunning for the second certificate. Only those with two COCs on a single horse qualify for the world meet. The winner of the Series Three event was Darul Iman Endurance Team's (DIET) Nazulki Muda, astride Indiana Rose, who clocked 12:43:53s, while third place went to TEMKC's Zainuddin Yusof on Texas in 13.08.23s. In the 80km category, Bukit Kiara Equestrian Club's (BKEC) Yusnar Yusop on Two Step clocked 6:25:30s to win from Kuala Lumpur City Hall's Muhd Arif Samsuri, astride Nagawangsa (6:39:16s). DIET's Azman Mat Rifin on Kelkette Park Dual (7:16:24) was third. Thetford Endurance Race in England. BAHRAIN'S Royal Endurance team, led by Shaikh Nasser bin Hamad Al Khalifa, will today be taking part in the Thetford Endurance Race in England. The event will consist of two categories - a 120-kilometre race and a 160km competition. Shaikh Nasser, who won Thetford's 160km event last year, yesterday decided to take part in the 120km race this time. The Bahrain Royal Equestrian and Endurance Federation (Breef) president had his horse 'Sprite' undergo official medical check-ups yesterday conducted by the International Federation of Equestrian Sports (FEI). Shaikh Nasser has also already secured his qualification for the 160km category in the FEI World Endurance Championship, which is scheduled to take place in Terengganu, Malaysia in November later this year. Meanwhile, it is still unsure if Breef first vice-president Shaikh Khalid bin Hamad Al Khalifa will be taking part in today's race; it will depend on the schedule of his ongoing studies in the UK. Set to compete alongside him is Breef first vice-president Shaikh Khalid bin Hamad Al Khalifa, who will be riding 'Sebastian'. The kingdom's other participants include Shaikh Daej bin Salman Al Khalifa who will be riding 'Wishky', Yousef Taher riding 'Canada Coy', Mohammed Abdulaziz riding 'Kafir', Mohammed Al Thawadi on 'Ciscada', and Lorent Mosti from the technical team riding 'Bisk'. The event will be the Bahrain's third participation for the season. The first was the Bahrain Cup in England, while the second race was in Austria. Riders representing the UAE will also be participating in the race. They will be led by UAE vice-resident and Dubai Ruler Sheikh Mohammed bin Rashid Al Maktoum along with Dubai Crown Prince Sheikh Hamdan bin Mohammed bin Rashid Al Maktoum. Qatari riders are other entrants from the Gulf. A COASTAL-BRED horse which won a world cup qualifying equine endurance event at Sassafras on Saturday has attracted international interest, with buyers willing to pay a six-figure sum to acquire the mare. Beer Street Tiger Lily, ridden by her owner and breeder Tony Purton, of Takone, won the Federation Equestre International (FEI) three-star 160km event against an international field, and has attracted interest from the Middle East, Malaysia and Saudi Arabia. The field for the Sassafras event included world No1 ranked male endurance rider Yousef Ahmed Al Bloushi, from the United Arab Emirates. Despite the event being a world cup qualifier, Purton said he would not compete in the world cup in Malaysia in September. "I've got no doubt she would do well over there, but it's an expensive trip," he said. Purton said Australian endurance horses were considered among the best in the world and were highly sought after, and in particular horses from Tasmania. He is still undecided on whether or not to sell his champion nine-year-old mare. "I've bred her parents and grandparents here at Takone and I hate selling any of my horses," he said. Purton said Australian endurance horses took several years of training to perform at the elite level. "You just don't breed them, you have to train them and build them up to become good endurance horses," he said. Purton said cashed-up Arab buyers in particular, who were unable to breed and train endurance horses in the Middle East, were in the market for ready-made Australian endurance horses. The world cup qualifying time for Saturday's Burnie Equine Endurance Riders organised event was 12 hours and 20 minutes, with Puton's mare completing the six-leg event in eight hours and 17 minutes. Lilydale rider Sonia Brown kept pace with Purton for much of the 160km and was only three minutes behind with 10 km to go. Second place was taken out by Penny Toft, from Queensland, riding Electra BBP Murdoch. Toft had qualified for the world cup at a previous ride in Queensland, but still completed the Sassafras event in 8:40 hours. Junior rider Bridget Nottle, riding one of the Toft endurance horses, Kitt, also completed the ride in 8:40. Third place was Malaysian rider Faizal Ismail, riding Alpine Ripplin Waters, in a time of 11:23 hours, followed by fellow Malaysian Sjn Zulkefli Saari, riding RCM Shatman, in 11:24, also qualifying for the world cup in their home country. The final three places went to three local riders, with only eight horses completing the event. A total of 12 were vetted out and one withdrew. Carolyn Foley, of Staverton, riding Valley Park My Solitaire, finished in a time of 11:52 hours, followed by Sonia Hodgetts, of Elliott, riding Millennium Star, in a time of 13:13, and Kaye Mitchell, of Wynyard, riding Krystal Creek Karisma, finishing in 13:30 hours. The high rate of attrition was attributed to the concussive effect of the gravel roads on which a large part of the event was conducted. The Australian Endurance Riders Association also conducted 80km, 40km and 20km rides in conjunction with the FEI event, attracting a field of 48 riders. Diego Zamora, of Costa Rica, riding Samurai finished first at the 2008 Mayan Adventure ride in Guatemala! Riders from Guatemala, Costa Rica, and Honduras finished in the 160km division! Tom Noll Turtles at 2008 Vermont 100!! [RC] Vermont 100 - Farzad Faryadi 1st to finish! Kathy brunjes won the 50 miles. The royal family of Dubai set a unique record last weekend as eight of its members competed in the same endurance ride. HH Sheikh Mohammed Bin Rashid Al Maktoum is passionate about endurance, a sport he competes in alongside his family. At Euston Park on Sunday, 13 July at an international 80km endurance ride, Sheikh Mohammed competed alongside three of his sons, Sheikh Hamdan, Ahmed and Mayed, and four of his daughters, Sheikha Latifa, Maryam, Futeim and Sheikha. The ride was won by Sheikha Latifa with her sister Futeim a close second. Sheikh Mohammed's wife, Princess Haya, announced in The Sunday Times on 13 July that she intends to return to the Olympic show jumping ring in London 2012, riding for the country of her birth, Jordan. Guatemala, Mayan Adventure Ride 2008. On Saturday July 19 th , the Maya Adventure Ride 2008 will take place at the Ingenio (Sugar Mill) Magdalena, La Gomera, Escuintla, Guatemala. It is the most important equestrian event of Guatemala in 2008. According to Fernando Paiz, President of the Organizing Committee of the event, this race will be a very exciting new variation of endurance, it will be held by night. The Committee searched specifically for a geographical and climate region in Guatemala that would be similar to the conditions in Malaysia where the World Championship of Endurance will be held in November of this year. The Malaysia event will also be held at night due to severe climate conditions. The riders and horses will face very harsh challenges of severe humidity and heat up to 40 degree Celsius. Dianne Luker truly beat the odds, battling night blindness and a last minute call up, to take out the 2008 Horseland NSW State Championship endurance ride on Anabriar Khaboul. Anabriar Khaboul’s Wellington based owner and rider, Peter Cooper, was recovering from heart surgery and thus unable to compete in the grueling 160 kilometre event and called upon Luker to ride in his stead, a choice that proved successful. Luker had ridden Anabriar Khaboul previously and was on the horse, ready for the 2am start at Manilla, north of Tamworth, along with the race’s 85 other entrants. “I had ridden the horse earlier in its career but it is 10 times the horse it was then,” Luker said. It wasn’t easy going for Luker either, as the experienced endurance rider suffers from night blindness. It made the early start in the race difficult. “Friends of mine are aware of my poor night vision and there is always someone to stay with me during the dark,” Luker said. The horse was a favourite going into the race and didn’t disappoint, with Luker crossing the finish line holding hands with Stuart Hitchcock to signify that the race finished in a tie in a time of 10 hours and nine minutes. Hitchcock, on the horse Farras, had caught up at the end of the fourth stage and the two riders agreed to finish in equal first, with Luker winning the lightweight division and Hitchcock the heavyweight. Both horses were deemed the fittest in their divisions by the vet panel. Luker said it was not unusual for two horses to tie the race because the motto for endurance racing is “to complete is to win”. “The ride organisers did not want a gallop finish, as it could be dangerous and a bit rude to ask a horse to do that after he had taken a person 160 kilometres,” Luker said. Endurance riding involves five stages over 160 kilometres with a one hour rest and vet check betweens stages. INVERELL endurance rider Clare Fleming has returned successful from the NSW and Queensland state championships. The events were only one week apart this year and Fleming said her motto was “to complete is to win”. The endurance championships involve a 100 mile (160km) ride in one day, which is divided up into a minimum of five tracks. Horses are presented to the vetting team before the ride begins and then at the end of each track. Only if the horse is deemed fit to continue, the rider is able to set off onto the next part of the ride. “After vetting through successfully at the end, riding 100 miles (160km) in one day, I definitely feel like a winner,” Fleming said. It was a long week for Fleming, it started with a 2am start on Sunday when she saddled up her bay Anglo mare Birramalee Queen of Hearts and set off to ride 100 miles in the countryside surrounding Manilla. There where five legs - 43km, 43km, 30km, 30km and 14km. After riding for fourteen hours and one minute, Fleming’s mare was judged by the vetting panel to be sound and healthy. Together, they placed eighth Lightweight, and were among the 53.49 per cent of the initial 86 riders that completed the ride successfully. Fleming was very pleased with this result because last year, at the QLD State Championships her mare was vetted out after riding the 100 miles. Then less than one week later at 1am on Saturday, Fleming again saddled up. This time, she rode her grey Arab gelding Mangueira Moksha. This ride was based at Imbil in QLD, and consisted of six legs: 37km, 32km, 30km, 35km, 21km, and 15km. At the fourth leg of the ride, the vets were very concerned about the tenderness displayed by Moksha at the touch of their hand in the saddle area. It looked like he was going to be vetted out. Fleming then applied ice to his back, changed saddles and rode a lot slower in the last two legs of the ride. This strategy worked with Fleming and Moksha successfully completing the ride with a time of 13 hours and 56 minutes. Together, they placed second Lightweight and were amongst the 52 per cent of the 55 riders that completed. Fleming said it was a very challenging ride in the mountains. The Red Truck Raggers, made up of Fleming, Leila Calander and Ian Davidson, won the team event with the fastest combined riding time for the 100 miles. They were presented with the Timms Trophy. This year the Tom Quilty Gold Cup Ride is at Nanango in QLD. Fleming is hoping to compete in this international event and in just 10 weeks time she will again saddle up one of her endurance horses to ride 100 miles in one day. A WORLD CUP qualifying event at Sassafras tomorrow has attracted international endurance riders to one of the biggest equestrian events in Tasmania in years. The 160km ride is a Federation Equestre Internationale (FEI) three-star event and has attracted entries from Malaysia, New South Wales and Queensland. The ride is being conducted by the Burnie Equine Endurance Riders club (BEER) and will be the first time a world cup qualifying event has been held in Tasmania and the first FEI-rated event to be held in Tasmania for more than three years. The ride will be based at Smith and Others Rd at Sassafras and will use tracks on nearby pine and eucalypt plantations. The gruelling ride will be one where physical stamina and the mental fitness of both horses and riders will be pushed to their limits. The endurance event will start at 2am tomorrow and riders will need to complete the six legs in under 12 hours and 20 minutes, finishing by 5.20pm (including compulsory hold and vetting periods), to qualify for the world cup, which will be staged in Malaysia in September. The six legs will vary from 20km to 30km in length and riders will be given a maximum of 15 hours to complete all six legs. Queensland's Peter Toft is expected to be a strong contender and will be looking for more success in Tasmania. Toft won the sport's most prestigious national event, the Tom Quilty Gold Cup, when it was held in Tasmania in 2001. A strong Tasmanian contingent of riders is also expected to compete, including Lilydale trio Noel Lockhart, Alison Dent, and Bradley Hill. A youth section will be incorporated for riders between 14 and 21 years old. As leader of the Tasmanian junior points series, Bradley Hill is keen to ride his horse Lockleigh Park Star against national competitors. Alison Dent and Noel Lockhart will also be hoping for a good result. About 30 Tasmanian riders are expected to contest the shorter 80km, 40km and 20km non-qualifier events, in addition to the entry list of 20 riders for the 160km endurance ride. Kevin James and Sarah Hamer train endurance horses for Sheik Mohammad bin Rashid Al Maktoum of the United Arab Emirates (UAE). Endurance riding horses involves riding long distances (50-150km) over several days with vets constantly checking the animals. Kevin and Sarah used to have 20ha at Mayfield on which they trained the horses but were able to sell their farmlet at a high price and buy a 40ha block at Herbert nearly four years ago. Not only is the land cheaper in Herbert but there is no crime, facilities are good including the school. The couple have four children under the age of eight, the youngest about six months old. Kevin who is in his early 50s has been doing speed endurance riding for 30 years. He was part of the New Zealand team which won the world championship in 1998 in Dubai. It gave him great exposure and people from around the world wanted him to train horses including the Sheik. In 1999 a Sheik's representative asked him to buy and train horses for the UAE's vice-President, Prime Minister and ruler of Dubai. Kevin says the Sheik has thousands of horses based around the world and until the equine flu horses were sent from Australia to Herbert. A batch came in just before the restrictions came on. They are training about 16 horses which they prepare to a certain stage. Only six are from the Australian programme the rest are New Zealand sourced. While people living in or outside cities spend 30-40 minutes or even longer travelling to work each day, he walks out the door. Dubai: His Highness Shaikh Mohammad Bin Rashid Al Maktoum, Vice-President and Prime Minister of the UAE and Ruler of Dubai, on Sunday attended the European Open Endurance Women's Championship. Shaikh Hamdan Bin Mohammad Bin Rashid Al Maktoum, Crown Prince of Dubai, Shaikh Ahmad Bin Mohammad Bin Rashid Al Maktoum, Chairman of the Dubai Events Management Corporation, and Shaikh Majid Bin Mohammad Bin Rashid Al Maktoum, Chairman of the Dubai Culture and Arts Authority, also attended the race. Shaikha Latifa Bint Mohammad Bin Rashid Al Maktoum won the individual title. Shaikha Latifa, Shaikha Mariam, Shaikha Futaim and Shaikha Shaikha, the daughters of Shaikh Mohammad, won the team title. Twenty-six riders, representing many European countries, took part in the race. This victory comes as a new addition to the previous accomplishments achieved by UAE. The weather forecast was unfortunately one hundred percent correct as thunder lightening and heavy rain engulfed the riders at Assisi, almost as spectacular as the fireworks at the welcome party. At 5am on a very cold morning 46 riders from nine nations set out on the 160km course that had already been battered by the heavy rain of the preceding days. The course had been considerably altered from that used for the 120km ride last year, no longer containing the section along the cobbled streets in the centre of the most beautiful and historical town of Assisi. The general opinion was that is was a good, technical but difficult course and a vast improvement compared to last year. GYMPIE region endurance riders can look forward to a big season with State Championships at Imbil this weekend and the prestigious Tom Quilty Gold Cup in Nanango in two months time. And this weekend's riders can expect a more interesting event, with recent rain creating many more flowing creek crossings than is usually the case. After overcoming the effects of last year's equine influenza outbreak, more than 100 of Australia's best riders will assemble at Imbil Showgrounds on Saturday to compete in the 2008 State Endurance Riding Championships. Event publicist, Peter Hennessy said the event would be held over "a spectacular 160km course through the Imbil and Kenilworth State Forests." "It is a test for both horses and riders to achieve this feat in less than 24 hours," he said. "Horses are subject to rigorous veterinary checks every 20km approximately and any sign of lameness or metabolic disorder will immediately disqualify the competitor." Promising many excellent photographic vantage points for spectators, he said the course would be "even more interesting this year, as there will be many flowing creek crossings." Mr Hennessy said organisers were anticipating the winner would cross the line about 4pm Saturday, after a midnight start on Friday. And, in September, the Tom Quilty Gold Cup is expected to draw competitors internationally, as well as from all over Australia. The major endurance ride will be held in Nanango on September 19 to 21. "Considered one of the most challenging and competitive horse events in the world, the 'Quilty' attracts champion riders from all over," publicist Pauline Clayton said yesterday. "Last year, the King of Malaysia was one of the competitors at the Nanango International Endurance event," she said. The ride is a brainchild of outback legend RM Williams and now attracts up to 250 of the world's finest riders. Ms Clayton said that with friends, buyers, vet teams and officials, a crowd of more than 1000 is expected, with many camping out at the showgrounds. "Despite metrics, the original idea of riding a horse 100 miles in a day has held true and the course is now 160km through the hilly terrain of the East Nanango State Forest in the South Burnett region," she said. photo: view up the American River's middle fork canyon on Monday shows how smoky the Western States Trail route has been in recent days. The Quarry Trail, part of the Tevis Cup route riders will ride on July 19 and 20, can be seen on the bottom right. Now it’s the turn of Tevis Cup organizers to think the unthinkable. This year’s 100-mile ride from Squaw Valley to Auburn is still scheduled to start July 19. But as the days count down and thick smoke from Placer County fires continues to lower air quality and raise health concerns, the Western States Trail Foundation has established a timeline to provide answers to the 150 riders and 800 volunteers. Under that timeline, a final decision could come July 16. Tom Christofk, trail foundation president, said Monday that ride organizers were moving ahead “full throttle” with plans to stage the ride along the Sierra Nevada’s Western States Trail July 19 and 20. “The buckles are made, vendors are locked in and the contracts signed,” Christofk said. Cancellation of the 54th running of the prestigious horse ride would be unprecedented. But so would have been cancellation of the Western States Endurance Run. Organizers decided June 25 – three days before the June 28 ultra marathon – to cancel the event because of smoke and safety concerns. Christofk said that fire patterns indicate no immediate threats to the Western States Trail or difficulties that would hinder firefighting operations on the Forest Hill Divide. That leaves smoke – or lack thereof – as the key to keeping the Tevis Cup running. As Tevis Cup planning moves forward, committee members will meet Wednesday with U.S. Forest Service officials in the high country of Robinson Flat along the trail. A day later, Christofk said that if the chances are 50-50 that the ride could be cancelled, riders coming from 1,000 or more miles away from the event would be notified of conditions. Riders from the United Arab Emirates, Japan, Canada and Europe are due to take part in this year’s Tevis Cup – one of the world’s most prestigious endurance rides. On July 14, a Monday, committee members would re-assess the smoke situation to again consider notifying participants of smoke levels. Then on July 16 – a Wednesday – committee members would have a clearer indication of whether unhealthy levels of smoke would continue to lurk in the air on the Tevis Cup weekend. The ride has come close to cancellation just twice before. In both those instances, Christofk said he’s been told that ride founder Wendell Robie made the decision the night before to keep it going. Potato Richardson, a two-time Tevis Cup winner, said that he has never seen anything like the smoky conditions now blanketing the area in the 36 years he’s been riding in the event. One year, the ride was re-routed because of snow levels but never because of smoke, he said. Richardson was in the same position last week as the Tevis Cup leadership. On Wednesday, as president of the Gold Country Endurance Ride in the Georgetown area, he was forced to announce that smoke would cancel this past weekend’s 30- and 50-mile rides. At least 100 riders had to make other plans. Richardson said he was playing host at his Cool-area home to three riders from London, England, who were out for the event. The weekend’s smoke was thick enough to keep him and his guests from doing any serious riding but they did get out for a slow walk Sunday. Monday was even worse, however. “The situation’s so bad that I woke up today and smelled the air and said to myself that I didn’t even want to be outside,” Richardson said. The Journal’s Gus Thomson can be reached at gust@goldcountrymedia.com. Australia's prestigious Tom Quilty Gold Cup endurance ride will take place in Nanango, Queensland, in September this year. Considered one of the most challenging and competitive horse events in the world, the "Quilty" attracts champion riders from Australia and overseas. Last year one of the competitors at the Nanango International Endurance event was the King of Malaysia. In 1966, 26 riders began the first Tom Quilty, a 100-mile endurance ride on a course west of Sydney. Last year the Tom Quilty Gold Cup was held in Western Australia. The ride, the brainchild of RM Williams, now attracts up to 250 of the finest riders in the world. 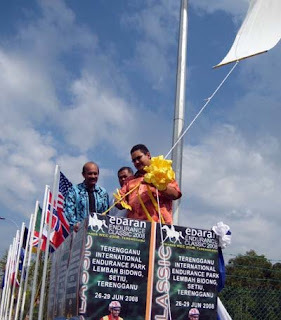 The Edaran Endurance Classic 2008 held at the Terengganu International Endurance Park, the venue of the forthcoming World Endurance Championship 2008 in Terengganu, ended 29 June 2008 with 8 successful completions out of 18 starters in the CEI 3* 160KM ride category. Of the 8 completions, 6 obtained their Certificate of Competency (COC). His Majesty Seri Paduka Baginda Yang Di Pertuan Agong's horse Cristal De Sulaiman bagged the Best Condition Horse Prize for the CEI 3* 160KM category. His Majesty successfully completed the 160KM ride and finished in fifth place. The top prize for the team for the 160KM went to the riders from Darul Iman Equestrian Terengganu. In second placing was the team from the Tengku Mahkota Kelantan Equestrian and third placing was won by Royal Terengganu Endurance Stable. The 2008 FEI World Endurance Championship was officially launched on Saturday 21 June in grand style with a 48 horse parade through the centre of Kuala Lumpur. The marching contingent of 48 horses was made up of Polis di-Raja Malaysia and DBKL's Mounted Units, and some of Malaysia's Endurance Team. They were accompanied by police outriders and two marching bands. Malaysia's Yang DiPertuan Agong and his consort the Permaisuri Agong were there to take their salute on their arrival at historic Dataran Merdeka.